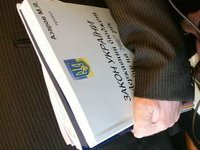 The law to repeal nine January 16 laws passed by the Verkhovna Rada on January 28 was published on the official Web site of the parliament's Holos Ukrainy newspaper on February 1. As reported, the Verkhovna Rada Ukrainian at an extraordinary session on January 28 cancelled nine laws adopted on January 16. The MPs cancelled a law introducing amendments to the law on the judicial system and the status of judges and procedural laws regarding additional measures on protecting the safety of citizens, drafted by Party of Regions MPs Volodymyr Oliynyk and Vadym Kolesnichenko, as well as the law introducing amendments to the Verkhovna Rada's rules of procedure, which simplifies the procedure for granting consent for the criminal prosecution, detention or arrest of MPs who committed a crime. The MPs also voted for the cancellation of the law on the exemption from criminal responsibility of participants in peaceful rallies that occurred from November 21 to December 26, 2013, the law introducing amendments to the law of Ukraine on free legal assistance regarding the postponement of the entry into force of the provisions of clause 6, section VI "Final and Transitional Provisions," and the law introducing penalties for the desecration of graves of World War II participants comes into force on the day following the day of its publication. They also cancelled the law introducing amendments to the Tax Code regarding the exemption of natural gas imports to Ukraine from VAT, which was suspended in late 2013. On January 31, Ukrainian President Viktor Yanukovych enacted the repeal of these laws.